Effective July 1, 2011 the retail price of Microsoft Certifications will increase worldwide. * This change reflects the significant value that our certifications provide to our customers and our continual investment in new and enhanced Microsoft Certifications and other program improvements. *Price change will be effective in India on August 1, 2011. Ssome of the prices for Microsoft Certification exams for students and academic institutions will increase, but the discount will remain significant. Exam prices can vary by country or region. Note Microsoft Learning does not anticipate that this price increase will impact Microsoft Certified Master (MCM), Microsoft Certified Architect (MCA), Microsoft Technology Associate (MTA), and Microsoft Office Specialist (MOS) Certification exams. MindManager is often used to create dashboard and project plan maps that contain many levels of detail specifying action items, resources, and due dates. Especially when used to manage team activities, these maps can become complex. Power Markers is an add-on for MindManager 8 and 9 for Windows that generates real time lists to help you quickly assess priorities, identify upcoming deadlines, and navigate large maps.Power Markers generates a complementary list view of MindManager maps organized by your tags, markers and topic colors to help you quickly find essential information and navigate larger maps with ease. Mindjet Power Markers is available in English and is compatible with MindManager Versions 8 and 9 for Windows. The Microsoft SQL Server Sustained Engineering team recently announced the availability of SQL Server 2008 R2 Service Pack 1 CTP. Both the Service Pack and Feature Pack updates are available for download on the Microsoft Download Center. Service Pack 1 for SQL Server 2008 R2 includes product improvements based on requests from the SQL Server community, and hotfix solutions provided in SQL Server 2008 R2 RTM Cumulative Update 1 to 6. This update introduces two new configuration settings that let you determine how long cached data stays in the system. In the new Disk Cache section on the Power Pivot configuration page, you can specify how long an inactive database remains in memory before it is unloaded. You can also limit how long a cached file is kept on disk before it is deleted. Saint George (ca. 275/281 – 23 April 303), the Patron Saint of England, was, according to tradition, a Roman soldier from Syria Palaestina and a priest in the Guard of Diocletian, who is venerated as a Christian martyr. Saint George is one of the most venerated saints in the Catholic ), Anglican, Eastern Orthodox, and also the Oriental Orthodox churches. He is immortalized in the tale of Saint George and the Dragon and a aiitng by Raphakl and he was one of the Fourteen Holy Helpers a group of saints venerated together in Roman Catholicism because their intercession is believed to be particularly effective, especially against various diseases. The episode of St George and the Dragon was a legend brought back with the Crusaders . The earliest known depiction of the legend is from early eleventh-century Cappadocia, (in the iconography of the Eastern Orthodox Church, George had been depicted as a soldier since at least the seventh century); the earliest known surviving narrative text is an eleventh-century Georgian text. His memorial is celebrated on 23 April, and he is regarded as one of the most prominent military saints. The news from Convergence 2011 in Atlanta (US) about the next major release MS Dynamics Ax 2012 is that general availability will be available in August 2011. A white paper describes a country-specific update that was released for India for Microsoft Dynamics AX 2009 SP1. For more information about the hotfix download, see Microsoft Knowledge Base article 2521264. For more information about other features that apply to India, refer to the Applications and Business Processes Help. Information that is specific to India includes (IND) in the title. Microsoft Dynamics AX 2012 introduces many new features and technologies that were not available in previous releases. 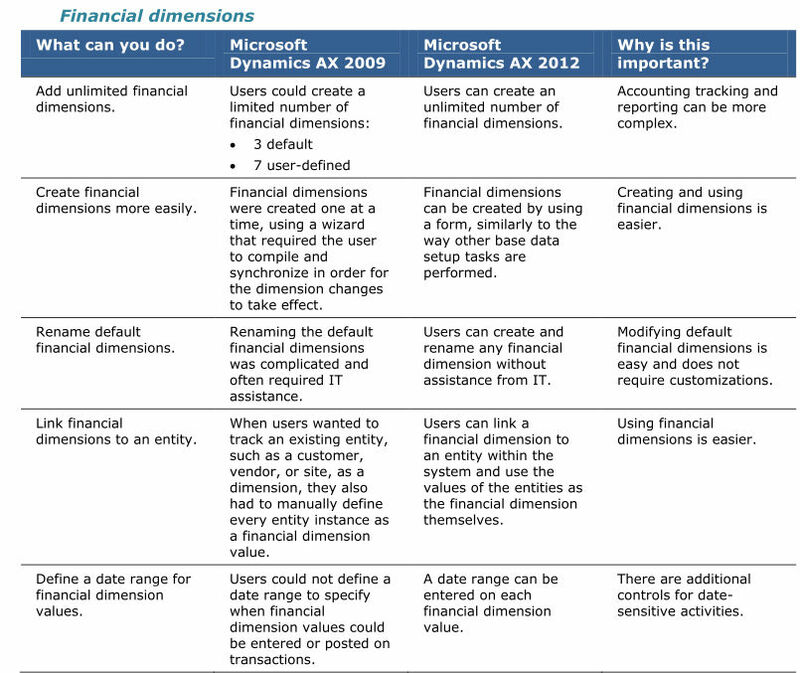 Additionally, changes introduced in Microsoft Dynamics AX 2012 update a number of existing features and technologies. Many of the technical changes have already been discussed in this blog and there equally impressive enhancements in the fucnitoanl areas. .
To learn more about the many new and changed features for Microsoft Dynamics AX 2012 that will give yoru business a competitive edge and improved controls and process automation, please contact us to find out more because the release is imminent. users and partners both have questions for Microsoft to answer about its plans. frequently and more easily to customers, and is more economical. Microsoft’s vast partner channel, whether in on-premises or hosted form. 4-Wheel driving and camping in the desert is a fun and enjoyable family pastime. However, the desert is a dangerous place when you get stuck, or lost. A map and a charged mobile phone – Binoculars are useful – many 4 wheel cars have a compass- in a sandstorm it maybe the only ay to find your way back to a main road. Though the desert may seem lifeless you may still encounter scorpions and snakes and stout footwear rather than sandals should be considered if you leave the vehicle . Camels , goats, or other vehicles may appear unexpectedly when you cross the ridge of a dune. A brightly coloured flag can help people locate you. Check your spare tyre . Tyres vary considerably, and desert driving for example needs different tyres and tyre pressure than wet driving. Most UAE cars should be fitted with tyres to withstand heat, but some imported cars may not have appropriate tyres. Be aware – it’s easy to get your car scratched and bumped – and yourself – Check your insurance both for yourself and your car- to see what is excluded. the rules of the road apply when you leave the desert. The newest version 4.0 of the Status Vision Designer® released today. This new version includes many features requested by the end user. Security. Status Vision Designer® supports Microsoft Active Directory using the LDAP protocol to control who has access to different parts of the window project. Security is also available for web projects. Design modifications to increase functionality. This includes the ability to create complex shapes by joining 2 or more shapes together, or by subtracting one shape out of another. Another design modification feature is added to help design time when aligning and spacing groups of objects that are selected on the design surface. Data interoperability, allows the creation of projects that can have multiple data sources. These data sources include all forms of OPC, including OPC UA, SQL, and ODBC. Status can also be extended to use any form of data. A living product, Status Vision Designer was built with the .NET Framework. What this meansfor the end user is that the software will always Grow with the .NET Framework. The new version of Status utilizes the .NET 4.0 Framework and Silverlight 4. Client Side Calculations, allow for the creation of bindable tags that are generated from the custom calculations that are created, or the calculations that are provided. 3D Controls have been added to the toolbox to help create a more realistic screen. Status Vision Designer® is offered as a powerful Windows and Web solution for the visualization of any business data and at a fraction of the cost when compared to other vendors. With no Tag limits, and New technology, this is, and will be, a very scalable solution for years to come. Are You Data Rich But Starving for Information? The attack appears to be indiscriminate in its targets, with compromised machines running ASP, ASP.NET, ColdFusion, JSP, and PHP, and no doubt others. SQL injection attacks, which exploit badly-written Web applications to directly perform actions against databases, are largely independent of the technology used to develop the applications themselves: the programming errors that allow SQL injection can be made in virtually any language. The underlying cause is a programmer trusting input that comes from a Web page—either a value from a form, or a parameter in a URL—and passing this input directly into the database. If the input is malformed in a particular way, the result is that the database will run code of the attacker’s choosing. The massive scale of these attacks (and the rapidly growing number of affected URLs) was first noticed by Websense Security Labs. On Tuesday, around 28,000 URLs were compromised; now more than 20 times more URLs are infected, and the numbers are still growing. The injected code is also found on a number of product pages on Apple’s iTunes Store. Apple fetches RSS feeds from podcasters that broadcast using iTunes, and in a number of cases these broadcasters have been compromised by the SQL injection attack. As a result, the malicious code has made its way into Apple’s system. However, due to the way Apple processes the RSS feeds, there appears to be no exploitation vector; the injected HTML is safely nullified. The AX 2012 client can be launched in development mode. This exposes all the development tools without having to jump through multiple contextual menus. The window is stripped of its Main Menu, Content Pane and Navigation bar. The X++ editor uses the same engine that powers the Visual Studio editor, with long-awaited features like: line numbering, block editing, change highlighting, etc. Models complement the code layering system in AX to goup objects . Models can be imported/exported from the system and withnaming, versioning and signing possibilities .The layer-based application object files (AOD-files) are replaced by a dedicated SQL Server database, which is also the model store. All application elements are located in this database, which is created by the setup program of Dynamics AX 2012 Models will be the new way ISV solutions are distributed rather than the current system of distributing AOD files). The new storage model with AX 2012 will remove the only single point of failure in the AX architecture. With AX 2009, the application is stored in a shared folder which is only accessible by the AOS. The high availability solution for Microsoft file servers is the Distributed File System (DFS) technology. However, Microsoft does not recommend creating multiple copies of .aod files, therefore the folder which contains the application files cannot be configured with DFS. For an AX developer, it will become a requirement to have a Visual Studio 2010 installation. With Microsoft Dynamics AX 2012, the integration between the two is to the point where managed code can now be called in business logic processes using event handlers attached to AX class methods. Through the use of the Application Explorer (AOT in Visual Studio), objects like tables or classes can now be used, with full IntelliSense, in managed code thanks to automatically generated proxies. In previous versions of AX, assigning security keys was the main task rl for a developer about . With AX 2012’s role-based security, developers play a much bigger role when creating new elements. Permissions are now assigned on the AOT elements and are grouped together in Privileges. These Privileges are then gathered in Duties which define a role. Standard, out-of-the box roles, duties, privileges and permissions are available to secure all functionallity in Ax2012!Previous versions had … no out-of-the-box security configured roles. Even if your select looked like ‘select from salesTable’,then it would become something like ‘select from salesTable where exists (select from custTable where custTable.PK = salesTable.FK and custTable.group = ‘x’)’. Applying multiple policies, would add extra ‘exists’ clauses to the query. This sounds like a performance killer but there’s a solution (as with most potential performance issues in ax2012). Policies that result in complex queries including multiple joins can be cached in temp tables that are populated the first time the complex policy-query is executed. The next time this complex query is executed … it is not … the results from the temp table are used in the query rather than executing the complex query over and over again. This is called a ‘myConstruct‘ and the refreshrate is customizable (on each execution, per session, …). Ax2012 comes with 7 myConstruct tables out-of-the-box. - A new feature for developers is the possibility to get the actual SQL statements (policies applied) from within X++. In Microsoft AX 2012, the application folder is stored in a database, so it is possible to integrate it into high-availability solution for SQL databases. That’s will improve data integrity; simplify backup procedure and offer high-availability for Microsoft Dynamics Ax architecture. 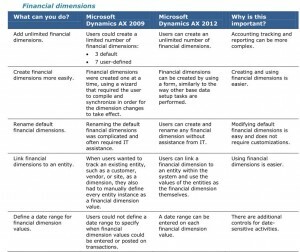 The list of smaller changes is huge – temporary tables in the database, table inheritance, data contracts, new user controls, AIF changes, just to name a few… Expect Ax 2012 announcements at Atlanta at end AprilThere is much to get used to with Dynamics AX 2012 and this release is a major step forward There is even more good news to come on the functional side which I will cover in a future blog when the wrappers come off.